Baghdad 1987, Latif Yahia (Dominic Cooper) is taken to see his former schoolmate Uday (also played by Cooper), eldest son to Saddam Hussein. Latif is told that a great honour had been bestowed upon him: because of the great likeness between them, he has been chosen to be Uday's ‘fiday’ - his body double. Trapped, tortured and fearful for the safety of his family Latif has no choice but to comply. A chilling vision of the House of Saddam Hussein comes to life as Latif is forced to become part of Uday’s world, witness to the horror of his insane life of debauchery, excess and brutality. A world entrenched in betrayal and corruption and an experience for which he almost pays with his life on more than one occasion. 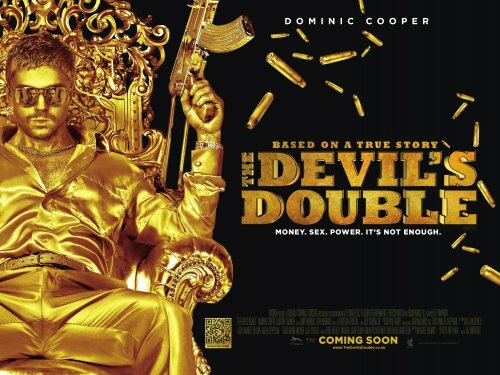 THE DEVIL’S DOUBLE is based on true events.